The Sonos Play:3 is the mid-range speaker of the Sonos family and the popular choice for customers who want to immerse themselves into the world of digital music streaming for the first time. The first question we normally get asked is ‘How loud does it go and what is the bass like?’ Our usual response is ‘ you will be pleasantly surprised!’ Most people have seen the Sonos PLAY:3 and assume it may fail to meet their expectation of a wireless music system, given its small form. Well, as most people who own these units will tell you, it adheres to its strapline given to it by Sonos – “The smaller, sexier, tuck-in-the-corner and blow-your-roof-off, all-in-one player”. As with the Sonos PLAY:5, it is available in black, as well as white, and connects wirelessly to your router. The Sonos Play:5 was Sonos’ first entry into the all-in-one wireless music system market, and we think it remains to date the best value all-in-one music system. So which Sonos system do you go for – the PLAY:3 or PLAY:5? If you are looking to get into digital streaming music and want to see what the Sonos system is like, then try the PLAY:3. As many of our customers have found out – the sound from something this size is astonishing. If at a later date you want to treat yourself to a PLAY:5, you can always put the PLAY:3 into the bedroom and use the built-in alarm clock to wake you up to your favourite music! Sonos today confirmed one of the worst-kept secrets in consumer technology, announcing a smart speaker with support for voice services including Amazon Alexa and Google Assistant — the Sonos One. The $299 speaker, coming to Australia October 24, will let users control their music with their voice and ask for music based on decade, genre, tempo, mood, or lyrics if they can’t remember the name of a song. Amazon’s Alexa isn’t available in Australia yet but it’s expected to be in the near future, and Sonos says the Sonos One will support it as soon as the service launches. Google Assistant support is coming next year. Sonos also announced it would be rolling out software updates to enable existing Sonos speakers to work with Amazon’s Echo and Dot devices. Sonos also announced that it will begin supporting Apple’s Airplay 2 in 2018, making it possible to play any sound from an iOS device including YouTube videos and Netflix movies on Sonos speakers throughout the house. Owners will also be able to ask any Siri enabled device to control music on Sonos speakers. “We live in a golden age of streaming entertainment,” Sonos CEO Patrick Spence said. SONOS CONNECT – Bring your old Stereo into the Streaming age. You may be one of the many people who have what’s known as a “first world problem”. That being, you have a perfectly good stereo system/home theatre setup at home, and can’t justify throwing it away, or relocating it to the garage. Also, older speakers are quite large, and may have become furniture and features in your home. However, you want to step into the new streaming age. So, what do you do? Fortunately, SONOS have solved this for you with the SONOS CONNECT. It turns your favourite amplified audio equipment into a streaming machine so you can keep the stereo you love and play even more music with it. CONNECT works with the amplified audio equipment you already own. Like a stereo system, a home theatre receiver, or even a built-in speaker system with a centrally-located amplifier. Plus, the analog, optical, and coaxial digital audio outputs ensure that you can use it with all your existing gear. Attach CONNECT to your amplified audio equipment using the analog or digital outputs. Plug it in. Then connect it to your WiFi using the Sonos app for uninterrupted wireless streaming. Hook a pre-amped turntable or any other amplified music source directly to your CONNECT to listen on your existing audio equipment. You can also send the music from the source to any other Sonos speakers throughout your home. If you are getting bored of your vinyl/cd connection, and don’t like your local FM radio stations, Sonos is for you. It plays more than 30 of the most popular streaming services, on-demand services, internet radio, your favourite podcasts and audiobooks, your go-to collection of downloads­ – whatever you love to listen to. https://ctgaudio.com.au/wp-content/uploads/2018/01/LogoAR.png 0 0 Admin https://ctgaudio.com.au/wp-content/uploads/2018/01/LogoAR.png Admin2017-08-16 08:28:192017-09-27 11:41:47SONOS CONNECT - Bring your old Stereo into the Streaming age. Playbar vs Playbase, spoilt for choice. The Ultimate SONOS question. To Playbar or Playbase? Playbar vs Playbase. The SONOS debate. If you are like me, deciding to stay in and watch a movie rather than battle parking and expensive snacks at the local theatre, is an easy decision. However, to do so, you need cinematic quality sound. For me, I need to hear every explosion, music score, history making speech, and unforgettable one liner that a movie has to offer. With the addition of the playbase in April this year, the decision to playbase or playbar has left more than a few of our valued customers confused. The Playbase was designed specifically to offer a space-saving solution for your TV sound. We all know that today’s slim-line TV’s compromise on sound in order to be slim (but that’s another blog). Its engineering makes it sturdy enough to withstand the weight of your TV on top (up to 35kgs) and slim enough (3.8cm deep) to slide underneath your TV, so in effect, it takes up no more space than your TV. The Playbar is ideal if your TV is already mounted to the wall. You can mount the Playbar to the wall directly underneath your TV with the addition of a wall mount, or you can attach the Playbar to your existing TV bracket with a range of accessories. It can also sit on furniture such as a TV stand but sitting at 85mm high, it does require more clearance than the Playbase and can intrude at the bottom of your TV screen. For my setup at home, the only option was the wall mount. Both the Playbar and Playbase have identical connections – an optical port for audio, one power supply port, and an ethernet port. Sonos keep things simple without compromising on quality. It also means you can swap them and you should have little issue with understanding the connections. The Playbase has 2 colour options – black and white. The Playbar like the Model T Ford, is only made in black. Unlike the Playbar, the Playbase has the new touch sensitive controls on the base of the product, comparable to the PLAY:5, meaning you can pause, skip, play previous and volume up and down at the slide or tap of a finger if you happen to be walking past. Both benefit from the Trueplay feature, allowing your speaker to calibrate and maximise performance based on your room’s dimensions. Trueplay also calibrates your personal seating position for an optimised audio experience. Both benefit from Night Mode & speech enhancement. Night Mode limits the loud parts of the audio and amplifies the quieter parts. This is a great feature not to disturb the rest of the house while listening. Speech enhancement is a great feature if you are having a hard time hearing what’s being said. Enabling this feature keeps the dialogue at a consistent level and reduces the volume of any loud sound effects. You can also pair your existing remote control for easy volume control. Sonos will also be integrating Amazon Alexa voice control later this year allowing Playbar & Playbase to be voice controlled. Stay tuned for this! Let’s first look at the spec of each speaker. They are very similar, both of which containing 6 mid-range and 3 tweeters but the Playbase also has the benefit of a woofer to improve bass response. The Team at CTG listened to the two options side by side, and for us the Playbase got the nod. The playbase has piercing vocals, excellent bass response, of which the additional woofer really helps, and the wide soundstage created despite its form factor (close your eyes and it feels like sound is coming from each corner of the room as opposed to just centrally). The sound was crisp, crystal-clear and with zero distortion. The PLAYBAR is wider in dimensions and as such, the sound travelled wider than the PLAYBASE offering a slightly further reaching sound stage. In real home usage, this means that if a car travelled from the right to the left of your TV screen the PLAYBAR will give a slightly more immersive effect due to its physical length. The sound from this speaker is deep, rich and completely unbiased, meaning it offers the perfect balance of low, medium and high frequencies. It’s kind and unobtrusive to the ears and in our mini Vs test, it reminded us why this product has won so many awards. It also really does look fantastic placed underneath a wall-mounted TV too. At low volumes, the sound quality between the Playbar and Playbase was indistinguishable but turn them up louder, and the Playbase tended to output a sharper vocal quality. The Playbar retails at $898, and Playbase at $999. We believe this pricing reflects a terrific investment, considering how easy the product is to use on a daily basis and the fantastic audio quality on offer. Of course, being part of the Sonos ecosystem, existing customers will also have the benefit of adding these to their current home setup. Customers completely new to Sonos can use it as the starting block to filling their home with music. Both Playbar & Playbase also have the upgrade potential to expand to a full 5.1 wireless surround system over time. https://ctgaudio.com.au/wp-content/uploads/2017/07/playbar-v-playbase.png 524 932 Admin https://ctgaudio.com.au/wp-content/uploads/2018/01/LogoAR.png Admin2017-07-25 13:15:432017-08-30 11:46:18Playbar vs Playbase, spoilt for choice. The Sonos Playbase is here folks. It’s time to get excited. Damn are we excited to get one of these bad boys into our office! From the sleek, simplistic design to the crystal clear sound we have come to love from the wide range of Sonos products currently on the market. Sonos has said that roughly 70% of TVs aren’t mounted on the wall and for this reason they have come up with the Sonos Playbase that is designed to sit on a TV stand or media center. The Playbase can also be combined with other Sonos wireless sub woofers to really enhance the ultimate audio experience within your home. This one looks like a real winner and from all reports it will not disappoint! The Sonos Playbase will be available for ordering from April 4th, you can place an order or find out more about the product here. Place a pre-order today and receive a $50 iTunes Gift Voucher! Sonos speakers can now run directly through the Spotify app. Making it easier than ever before to play music straight from your phone to your Sonos devices. Once your speakers are set up correctly through the Sonos’ app. You will then be able to set up your Spotify app to sync directly to your speakers. Although, please note that the paid version of Spotify premium is required to enable this feature. It is a worthwhile investment considering that you can now stream music from your phone, laptop or any computer within your house straight to your Sonos speakers. The revolutionary wireless smart speaker developed by Sonos. That allows you to control your speak wirelessly from your Android Smartphone/iPad/iPhone. Announced and released on July 20, 2011. 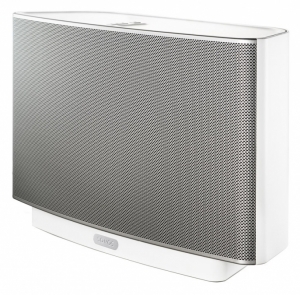 The first Sonos product to be able to be stood up vertically and be compatible with SonosNet. The speaker also has a feature that allows the user to stereo pair, this links the speaker to another Play:3 to release a separate left and right channel for audio. This can also be further paired with a sub and Playbar to form a basic home theatre system. The Play:3 is the mid-range speaker of the Play speakers in their respected product line. It has two mid-woofers, a bass radiator, a tweeter and 3 Class-D amplifiers. Therefore making it more capable of playback than the Play:1 which has 2 Class-D amplifiers, a tweeter and mid-woofer. Services such as Apple Music, Spotify, TuneIn and other streaming software can be used with the speaker. 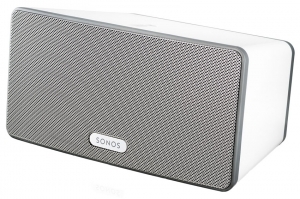 The Sonos Play:3 retails for $449 and we stock it for $399 – free shipping Australia wide. Or, if you would like to find out more about the product, please feel free to get in contact with us.